Funky and unique resin solar light in cute camper van design. 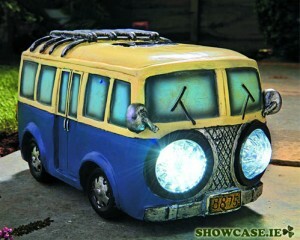 Features two white LED lights, in headlight style. Solar powered, with 30 x 60mm solar pane. Requires 1 x AA rechargeable battery, 1.2V/600mAh (included).